With the economy being so slow and many people choosing to stay home for their entertainment instead of going out, contractors are experiencing an increase in people finishing their basements to suit their entertainment needs. This article will describe the ways to transform your unfinished basement into a great game room complete with game room furniture and a pool table with billiard balls where you can entertain yourself and your friends and family for years to come. A lot of people that want to create a game room usually have a specific vision for what they would like for space. If they are huge poker or blackjack players, they may wish to put the card table as a focal point whereas if they enjoy playing billiards, they may want the pool table to be the main center of attention. Whatever you want, make certain to include all of your ideas to your builder before the renovation begins\starting so you can use the space in the best way possible. Once you have created a plan and have a good builder or contractor, who has thought of everything like the electrical wiring that you may want to house several 70’s and 80’s video arcade games or maybe even a large screen television Bank of viewing screens. It is much easier to put all of those things in before the drywall, and finishing touches are installed than afterward, obviously. A wonderful example of someone who finished basement for a game room is a man living in Chicago that was a proud Irish American who wanted to recreate an Irish Pub complete with gaming tables. He still has relatives living in Ireland, so for several years on his trips to Ireland he collected different pub things for his planned room including having some old Irish beams and old pub flooring from a tavern that was being destroyed to be shipped over. His builder used the old beams on the ceiling and the floor boards to make it feel like an old Irish Pub. He had a gorgeous handcrafted bar installed with a tap of Guinness of course as the main beverage offered. He had a beautiful pool table with green felt to pick up the colors of the Irish flag to coordinate the entire theme. He also has a special satellite to receive all of the Ireland out bol games on his large plasma TV screen as well. He plans on living there forever because he loves his Irish game room and pub so much as do all of his Chicago friends and family. If your basement is just wasted space, this is one of those basement ideas the whole family will love. 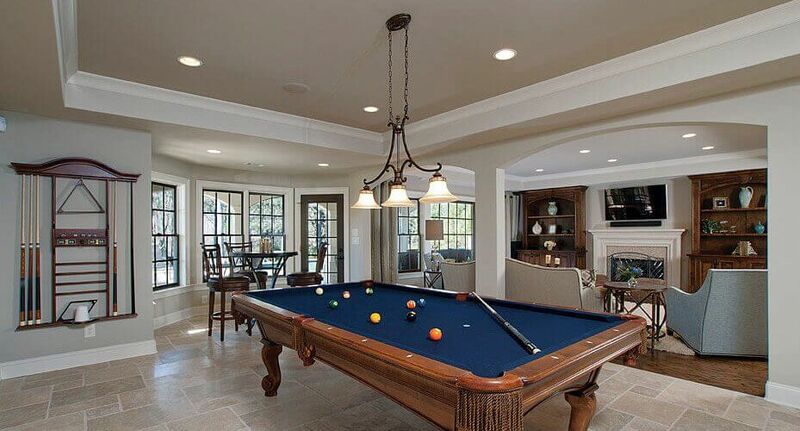 Do a basement remodel and turn it into a cool new game room – hangout area. To do that here are are some great tips and ideas. First you need to clean up the entire basement. You need to have your basement completely cleared and cleaned so you will be able to work. Starting from scratch will help you create this great basement ideas, and incorporate your own personal vision. Look For Pictures Of Cool Basements For Examples. Look in home magazines and on the Internet to find lots of pictures of finished basements to see what you like. You can find examples of different styles and colors to present to the family so that you can decide as a group what your game room basement remodel will look like. The game room basement idea needs to have some great colors on the walls to give the room extra life. This room will be used for a fun gathering place and it needs to look like a happy and exciting place. The proper use of colorful paint can help accomplish that. Basement floors can be get cold and are unattractive with no coverings, so you need it to be carpeted for that cosy “homey” feel. Again, just like with the paint, it is best to use some exciting colors for the carpet to make the room feel like an exciting and happy place. Like all basement ideas, the right furnishings can make or break a room. You need to find the most comfortable chairs and sofas because this is a room that will be used a lot. Take your family to all the furniture stores in town and let them sit on everything. If you are lucky, there will be a few items that will stick out that everyone loves. How about a refrigerator in your new game room? A pool table, ping pong table, Foosball table, and pinball machines are always fun and the most popular. Ask the family what they want in the room and try to get a consensus. This will be a room for the whole family and everyone should feel a part of it. This is one of those basement ideas that will bring the family together and be a positive experience for everyone. With this basement idea you will have added value to your home and to your family! Whatever kind of themed game room you want to have or what you have room for in your basement, making it custom for you is what makes the process a fun one. If you do not plan on living in your house long term, you may want to make it less customized to appeal to future buyers of your home someday as a thing to consider. Together with basement design ideas, homeowners must think in advance how to protect their basement about future problems. When it comes to the prospect of water penetrating the basement in the future, then make sure that the entire area in the basement is waterproofed and sealed. Remember that water seeks the lowest part of the house. Also, if you want to be saved from the troubles of termite infestation, then it is best that you use concrete in the construction of the basement. It is highly durable and does not deteriorate.